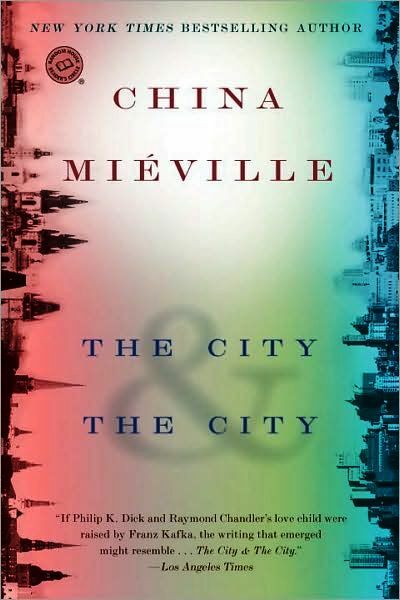 I won't give away the central premise that drives The City and the City, because one of its main draws — something that blew me away as I read it — is the genius with which Mieville subtly introduces it. Unless you read the back of the book (and if you haven't yet, don't), you'd never know that anything was amiss for the first few chapters. Then it slowly becomes clear that this is no ordinary setting. Even the very first line of the book seems conspicuously trivial until you go back and read it later. Setting aside, The City and the City is a police procedural murder mystery in structure. It starts with a body, and Tyador Borlu, detective of the Extreme Crime Squad in the ailing European city of Beszel, follows a series of clues to find the killer. However, the plot is more of a frame to hang the setting on than the central draw of the book. The path to resolving the murder mystery is one that passes through many of the peculiar implications of the peculiar setting. The writing style is sparse but descriptive, with plenty of evocative neologisms ("topolganger") and clever phrases ("Schrödinger's pedestrian") that show off Mieville's writing chops. Dialogue is particularly well done, with characters speaking like they do in reality: interrupting themselves, trailing off, implying more than they're saying. If I had to breach my unqualified praise, I would say that the subtle exposition of the setting gives way to heavy-handed over-explanation near the middle of the book. We already "get it" by that point, and it starts to drag as it loops over the same territory several times. Maybe it's to pander to people who would find the premise confusing, but anyone capable of thinking and reading at the same time should be able to follow along just fine. The weak middle makes the novel feel longer than it is. It's a minor complaint though, and as I said, generally the ideas at play here are mind-blowing. The setting will have you thinking long after you put the book down. Was this a fantasy novel? Could a place like this actually exist? With our arbitrary cultural conventions and taboos, are we already living in it? This is one of the best novels I've read in a long time. I highly recommend unseeing the real world for a while to explore the crosshatched streets of The City and the City.